I was recently asked to explain how the Z-LASIK vision correction surgery is performed in more details. First things first, what is Z-LASIK? Z-LASIK is one of most advanced technology for bladeless all-Laser LASIK surgery available today. In the Z-LASIK procedure, your surgeon uses the LDV Femtosecond laser to create the LASIK flap and the Excimer laser to correct your vision by reshaping your cornea. The LDV Femtosecond laser was developed by the Ziemer Group located in Port, Switzerland and has gained the Food and Drug Administration (FDA) approval for Bladeless LASIK in 2008. Z-LASIK, as other all-laser LASIK procedures, creates the LASIK flap by applying small fast pulses of femtosecond laser light, not a microkeratome with a blade. 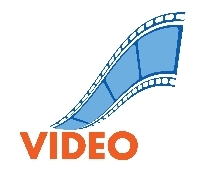 Now let’s watch this video which illustrates how the Ziemer FEMTO LDV Femtosecond Laser creates a corneal flap for a Z-LASIK procedure. Does The LASIK Flap Ever Heal Completely? This is question that is often asked. But, there is no simple answer. The LASIK flap does heal over time, but the wound healing occurs mainly at the flap edge and minimally in the area under the flap. The study found that the human cornea typically heals after LASIK in a limited and incomplete fashion, resulting in a weak scar under the flap that is on average 2.4% as strong as normal corneal stroma. On the other hand, the LASIK flap wound margin heals by producing a 10-fold stronger peripheral scar that is on average 28.1% as strong as normal corneal stroma. This pattern of wound healing explains why LASIK surgeons can re-lift the LASIK flap with out complications, even years after it was originally created, to perform a LASIK re-treatment. In conclusion we can say that the LASIK flap does heal over time, but it is never completely healed. However, you don’t need to worry, the flaps will not move with normal daily activities, and are only at risk with direct significant eye trauma. So if there is any risk that you might take a direct blow to the eye after LASIK, you should wear protective eyewear (e.g., protective goggles). Cohesive tensile strength of human LASIK wounds with histological, ultrastructural and clinical correlations. Journal of Refractive Surgery. Vol 21, No 5. Sep-Oct 2005. You know that each LASIK procedure involves making a flap in the cornea. What is LASIK flap, exactly? Why LASIK flap is required? How LASIK flap is created? What are the recent advances in LASIK flap creation? What are the characters of the ideal LASIK flap? How does the LASIK flap heal? And what are the LASIK flap complications? Those are some of the most frequently asked questions about LASIK flap, and today I will answer them to give you a clear grasp on LASIK surgery. LASIK flap is a circular strip of the outer corneal tissue dissected away from the underlying corneal layers but left attached in one segment called the hinge. The most common location for the hinge is either the nasal (on the side) or the superior (upper) position. Nasal hinge vs. upper hinge LASIK flaps: Which is better? In the classic LASIK technique, the hinge position was typically nasal. Nowadays most LASIK surgeons create LASIK flaps with upper hinges. The flap can then be lifted up from the bottom, hence the name: down-up LASIK. The down-up LASIK technique is more physiologic because the blinking helps keep the flap in position and contributes to its smoothing. Also the gravity tends to position the flap in the best way to promote healing. On the other hand, LASIK surgeons who prefer the classic nasal hinge flap point out that creation of a nasal hinge flap reduce the risk of post-LASIK dry eye. In addition, it is easy to cut a nasal flap with many microkeratomes since there is no eyebrow to obstruct the path of the instrument. Why LASIK flap is required? LASIK is a type of laser vision correction surgery called “lamellar refractive surgery” because it is performed between the layers of the cornea. The LASIK flap is necessary in order to expose the deeper corneal layers to the excimer laser energy that reshapes your cornea to improve your vision. How LASIK flap is created? In conventional LASIK, your surgeon will use a hand-held device known as a microkeratome to create the LASIK flap. But if you are undergoing all-laser LASIK, your surgeon will make the LASIK flap using a type of high energy laser (femtosecond laser or IntraLase) instead of a blade. Is IntraLase better than microkeratome for flap creation? LASIK safety and results are excellent using the microkeratome when performed by an experienced LASIK surgeon for well selected patients. However, the introduction of the IntraLase laser allowed for greater precision and predictability when creating the LASIK flap. What are the characters of the ideal LASIK flap? What is the difference between IntraLase LASIK flap and conventional LASIK flap? The microkeratome flap is variable in its dimensions, since its creation is influenced by many anatomical factors such as steepness and thickness of each individual cornea. 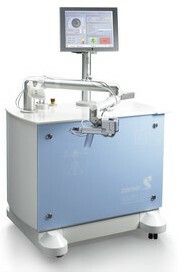 Conversely, the IntraLase laser flap maker can create a LASIK flap with the precise dimensions specified by the surgeon. 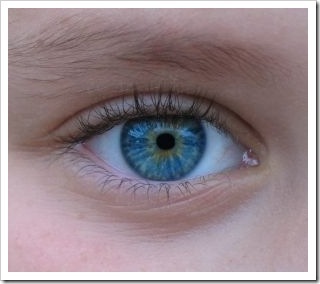 What is the ideal LASIK flap thickness? Traditional LASIK flaps were generally ranged in thickness from 140 to 180 microns. This is about one third of the total corneal thickness, given that the average normal cornea is about 540 microns in thickness. To maintain the corneal stability and avoid serious LASIK complications such as corneal ectasia by maximizing the amount of posterior corneal tissue that left untouched (This amount should be at least 250 microns and preferably 300 microns) after the LASIK procedure. To allow correction of higher degrees of refractive errors since thinner LASIK flaps preserve a greater amount of corneal tissue under the flap for treatment. To allow greater ability to perform enhancements, if required in the future. To reduce the LASIK recovery period since thinner flaps heal faster. To reduce the risk of post-LASIK dry eye syndrome since thinner flaps cause less damage to the corneal nerves. What is the appropriate LASIK flap diameter? Usually the diameter of the LASIK flap is more than 8.0 mm in nearsightedness and more than 8.75 mm in farsightedness. Larger LASIK flaps are better and required when the treatment zone is large; for example, in hyperopic LASIK, mixed astigmatism or custom wavefront LASIK. A larger flap is also useful if LASIK retreatment is expected. How does the LASIK flap adhere to the underlying cornea? How long does it take for the flap to heal after LASIK? The LASIK flap Healing process starts immediately once the flap is replaced by the LASIK surgeon after the laser treatment. However, the healing process time will vary from person to person due to individual healing differences. Generally, the flap will be secure within 2 weeks and after one month you can return to all activities, including sports. However, if there is any risk that you might take a direct blow to the eye, you should wear protective eyewear (e.g., protective goggles). What are the LASIK flap complications? 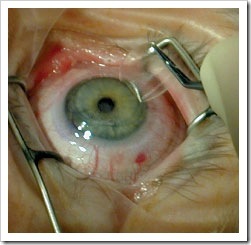 Many complications unique to LASIK are related to the creation of the corneal flap. Those complications include free flaps, thin flaps, incomplete flaps, flap buttonholes, flap decentration and epithelial defects. However, with the improvement in microkeratome technology and the introduction of IntraLase laser, the incidence of LASIK complications has dropped markedly. LASIK speculum is a medical instrument placed between your eyelids to keep your eye wide open and prevent you from blinking during the LASIK procedure.